Don’t read your ability to save into an entire economy’s ability to do so! While individuals can save for retirement, a society cannot: with few exceptions goods and services must be consumed when they are produced. Because retirees in Japan are increasing in absolute numbers and as a share of the population, the slice of output going to retirees will increase (else times for them will be grim and brief). The flip side is that those in the labor force must therefore reduce their consumption: the old can consume only to the extent that the young do not. At a societal level retirement is thus fundamentally, everywhere and always, a pay-as-you-go system. Modest exception exist. Housing can be stored, but except as your own residence its value is uncertain. Japan also has significant international assets, which can be drawn down to increase the consumption of imported goods. Neither change the qualitative analysis, because housing depreciates (lots of bad construction) while the share of trade in Japanese GDP (and assets relative to GDP) is small. To rephrase, unless those working reduce their consumption, either through voluntary savings or involuntary taxation, retirees cannot increase their consumption. Furthermore, the three-generation household headed by a matriarch or (more rarely) patriarch is now a distinct exception in Japan. Instead most consumption will be procured directly by the elderly, using resources which they and not their children control. Intrafamilial reallocation still dominates the provision for youth: in most cases (other than education, which is subsidized by the government) the goods and services children consume come from parents voluntarily reducing their consumption. At one time that was also true of the elderly (though for most of human history the share of individuals who “retired” was extremely low; people worked until death, even if they did not work themselves to death. Hence the pity long held forth for the childless widow, the exemplar of which is the story of Ruth in the Hebrew scriptures, with her entreaties to be adopted into Boaz’ household. The most important variable is thus the ratio of retirees to those working. The greater the (relative) number of retirees, the more that those working must tighten their belts in order that retirees maintain their standard of living. Note that the ratio of dependents to workers in Japan will not be at unprecedented levels, given the large share of young dependents in societies with rapidly growing populations such as Japan in the 1930s. This is an important reminder: there is nothing intrinsically unsustainable about Japan’s grey future. It is the minimal role of that the family will play that is qualitative different from the (many!) high-dependency societies of the past. Before looking at numbers, note four margins of adjustment. One (1) of course is to thrust retirees into comparative poverty. If nothing else, that represents noxious ethics: Japan’s baby boomers worked long and hard for a pittance while building the foundation of today’s prosperity. Nor are they retiring into riches -- Japanese public pensions are stingy. "Sharing the pain" may be politically important – but remember, though those over age 65 will be the most important part of the electorate. Back to ethics: why should workers today with a five-day work-week and homes full of the appurtenances of modern life not sacrifice a little? Plus tomorrow's retirees have been, well, promised retirement. 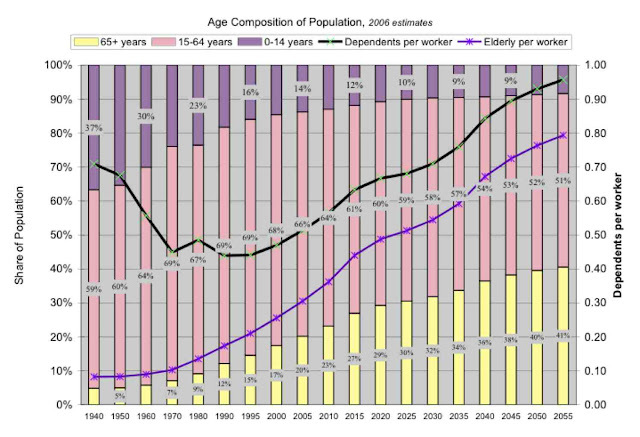 So there is inequity to this in the burden the young will bear, but generational inequity is inevitable when the age structure of the population changes in the magnitude that Japan’s will. Another (2) is to increase the participation rates of those of working age, specifically by facilitating the continuation of careers of women. Now that is already happening, as today’s young women (age 25-29) are either not marrying, or marrying but not quitting work, but older women are still largely relegated to part-time and other less-productive work. It is not yet clear whether that will continue as women in that cohort age – and because of low birth rates, each succeeding cohort will be smaller. This will be insufficient to offset aging. Then (3) Japan can encourage immigration. However, the primary economic benefit of immigrants is that Japan will not have expended the resources for their initial upbringing and education. Once in Japan they would be less productive than the native born due to language, social and other barriers. So it probably will take at least 3 immigrants to replace 2 retirees. Furthermore, they will insist on marrying and raising families, further lessening their impact on the societal challenge of providing for dependents. Finally, they will themselves age and retire. 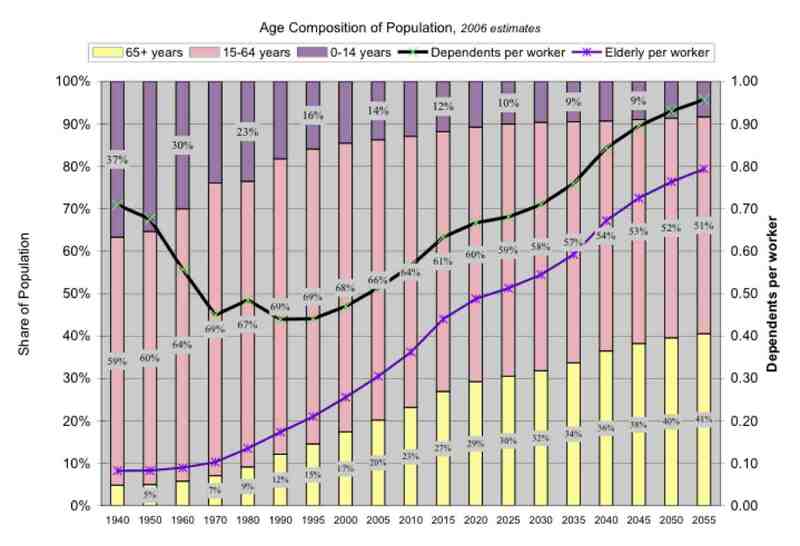 So immigration is not a solution, though it can shift the time profile of the greying of Japan. Last, we (4) can cheat a bit by adjusting pension rules to force older Japanese to delay retirement. This clearly shifts the ratio of retirees to workers, or to put it another way, workers pay more years of taxes and collect pensions for fewer years. Now this is an implicit tax, forcing older Japanese to change their behavior in a manner that lowers their utility, hence my use of the word “cheat.” It may however be politically acceptable in a society that is more oriented to the production of services rather than goods, as long as there is a realistic attitude to allowing earlier retirement disabilities. And as a quick back-of-the-envelope calculation, with people working 40 years (ages 25-65) and retiring 20 years (ages 66-85), a one-year shift adds 2.5% to revenue and cuts 5% from expenditures. That is an overestimate, because it ignores the bulge of baby boomers who are now starting to exit the labor force, and the slow increase in realized longevity. Furthermore the experience of Europe suggests that the level of disabilities rises sharply in the face of such policy changes, in part because retirement seems to be a luxury good and today’s society is (thankfully) well enough to consider it as an option. But there are those whose jobs involve physical labor or whose bodies otherwise wear out. My sense is that fiddling with the retirement rules is a likely component of any policy response. We could do the same thing at the young end of the spectrum, restricting access to schooling to encourage youth to go to work. I don’t think that’s a policy option worth further examination, politically unacceptable, penny-wise but pound-foolish. Plus it would be offest by the steady decline in the number of youth. But how big are the numbers, really? The easy part – assuming away changes on the above margins! – is to examine the ratio of retirees to the labor force: the actual age structure of the population is fairly clear, since all those who will be in the labor force in 2030 (and most of those in 2035) have already been born. Another challenge is the magnitude of consumption by those retired. While pensions are easy to estimate, health care costs include many imponderables. Data exist on all these, but collecting and then fitting them into a consistent framework is a task that far exceeds my own resources. So let’s simply assume that retirees on average consume as much as workers. The ratio is then key. At present there is roughly one retiree for every three persons of working age. That ratio will deteriorate to one retire per two people of working age circa 2030, and will peak circa 2055 at about one retiree for every 1.25 potential workers (after 2055 changes will moderate as the baby boomers die). Now the dependency ratio will not shift as much, because retirees are not the only dependents. The policy adjustments noted above would further mute the impact. But we can at least grasp the order of magnitude. Using the shift from 3:1 to 2:1, the resources required on a per worker basis are thus likely to need to go up by 2/3rds. With close to 15% of GDP in transfers, that implies a 10% net shift in savings, taxes and expenditures. With stable incomes, personal savings rates are unlikely to change much; indeed, the impact of low wages and unsteady jobs has probably been to lower savings. Some modest trimming of expenditures is likely, if only because it would be politically necessary, but the government has already pared public works 50%; modest cuts in support of agriculture, consolidation of schools and local government functions as the countryside depopulates – maybe 2% of GDP can be found. That implies that most of the adjustment must come from "enhancing" revenues, on the order of 8% of GDP. Add in the 4% of GDP required for debt sustainability (see the blog post below) and you get a 12% of GDP tax increase. Some of this will be collected via a forced postponement of retirement; much must take the form of a shift in the consumption tax and other taxes. With current revenue at around 34% of GDP, that would boost aggregate taxation towards 46%. This is still well below the highest levels found in Europe, and so is not a prelude of economic Armageddon. It surely will pose a major political challenge. Now other approaches can be used to estimate the cost of retirement, by examining pensions and healthcare costs by age and combining that with demographic projections. The bottom line seems, after much more effort that I've just expended, to also be around 10% of GDP. So I am fairly comfortable that I have the right order of magnitude – that the adjustments imposed by a greying population are large but not infeasible. One final note: can productivity increases help? That depends on whether retirees' consumption can be held fixed in real terms, which is basically what they were promised, or whether they will be politically powerful enough to increase their consumption in line with society as a whole: they get the same slice of a bigger pie. My hunch is that the latter is closer to what would transpire: politically it would be more difficult to hold benefits in check and to mandate later retirement if wages are rising strongly. However, I do not believe that productivity will henceforth rise at the 2% rate seen across the more prosperous part of the OECD, as I’ve argued that already on this blog. The following is based on discussion in my Japan’s Economy class on Wednesday, 8 December 2010. It is possible to run a small deficit forever, as long as the growth rate of total debt is below the growth rate of the economy. Note that here “deficit” is based on the budget inclusive of interest payments on debt – which means that the current operating budget must be in surplus. I do not try to address the issue of sub-national debt here. Nor do I try to calculate the extent to which the netting out of government assets to move from gross debt (nearing 200% of GDP) to net debt (100%) is appropriate. For example, BOJ bond holdings are offset by money, and so aren’t owed to the public. Conveniently, Japan’s net debt is (order of magnitude) 100% of GDP which makes the arithmetic straightforward. As long as the economy averages 1% growth, then the amount of debt can growth by 1% of GDP without the debt-to-GDP ratio (D/Y) deteriorating. Since D/Y = 100% then 1% growth of debt = 1% of GDP in additional debt. All Japan need do is lower its deficit from the current 9% of GDP to 1% of GDP. Note that 1% growth is a pessimistic number, so I’m not “cooking the books” in favor of sustainability. However, if interest rates rise, then the budget surplus must as well. No sign of that near term! In order of magnitude, half of that change will come from growth boosting (income) tax receipts. The other half (≈4% of GDP) needs to come from some combination of expenditure cuts and tax increases. Since Japan is in comparative terms lightly taxed, it is clearly possible to enhance revenues without large side effects. but the government is also small in size, so paring expenditures is likely more difficult though politically necessary (“cut waste” before raising taxes). Now using gross debt instead of net debt doesn’t change this story much – in fact, the arithmetic means that with 1% growth you can run a 2% deficit and not see conditions deteriorate. But in the background interest paid on debt also doubles, so it’s not a pleasant tradeoff: if interest rates were 3% then with 100% D/Y you need to run an operating surplus of 2% of GDP (hence a deficit inclusive of interest payments of 1% of GDP). With 200% D/Y interest payments double to 6% and so to keep yourself to “only” a 2% deficit requires that you run an operating surplus of 4% of GDP. Ouch. Furthermore, the impact on the budget and the deficits of a short-term spike in interest rates is amplified. With higher debt levels there is likewise less leeway to issue more debt in the face of a recession or a major natural disaster. Furthermore, the above analysis is well recognized by both political parties (the DPJ and the LDP) and by the general (voting) public. There is however all too good a recollection of the disastrous timing of the last round of budget consolidation – reduced expenditures and a major tax increase all started April 1, 1997, and this was followed by a deep recession, a banking crisis and the onset of chronic deflation. To date this agreement in principle hasn’t been matched by an agreement on specifics, specifically timing. Since 2011 doesn’t look like it will be a year of robust growth, and there has to be an election by summer 2013, my own judgment is that action won’t be seen until fall 2013. By that point (since tax increases won’t be instantaneous, part of the lesson of 1997) debt/GDP will rise another 20-25 percentage points. Still, (i) there is no crisis and (ii) the numbers are in the range of political feasibility (raising the consumption tax to 10% will bring in an additional 2+% of GDP in revenue). instituting a tax ID system would close the remainder of the gap. It helps that Japan is a large economy, has no debt denominated in foreign currency, and indeed has substantial foreign reserves and private foreign assets. Constituents of the European Monetary Union (and sub-national governments everywhere) face a different issue: while institutional investors may want to hold assets denominated in the currency of their debt, they don’t have to hold the assets of any particular sub-national entity (and the smaller the entity – Greece and not Spain – the less the need). Hence I won’t start worrying until we get through the next election and the timing is still bad.